The International is a huge competitive gaming event. I attended for the first time this year and really enjoyed it for a lot of different reasons. From the ambience of the arena, to the 10+ million dollar prize pool, to the water bottle souvenir, it was a great event and a huge success. I would love to go again next year and the experience has gotten me really enthusiastic about eSports in general. Here are a few of the things that made it so special. After picking up the pass for the 4 day event from the outside stations at the front of the arena, the next stop in checking in was the “bag pickup”. At this tent friendly staff punched a hole in your entrance pass and you received a handy backpack which came with a variety of items. 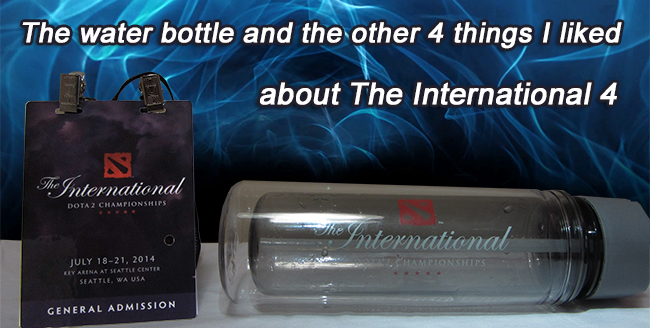 One of these items was the official Dota 2 water bottle, with The International emblazoned down the side. Even though it’s made out of plastic, the bottle still feels like a high quality product. It has a nice isolation layer to keep your cold drink at a good temperature for a while. This relatively small item is one of my favourite souvenirs from my weekend at TI4 because it’s a great water bottle that I will keep using on a daily basis. Thanks Valve! The goodie bag was filled with many more items like a hero pin, a secret shop order form, an information booklet on the various teams attending the event, and trading cards. Receiving the goodie bags was like Christmas morning for every Dota player and attendee. 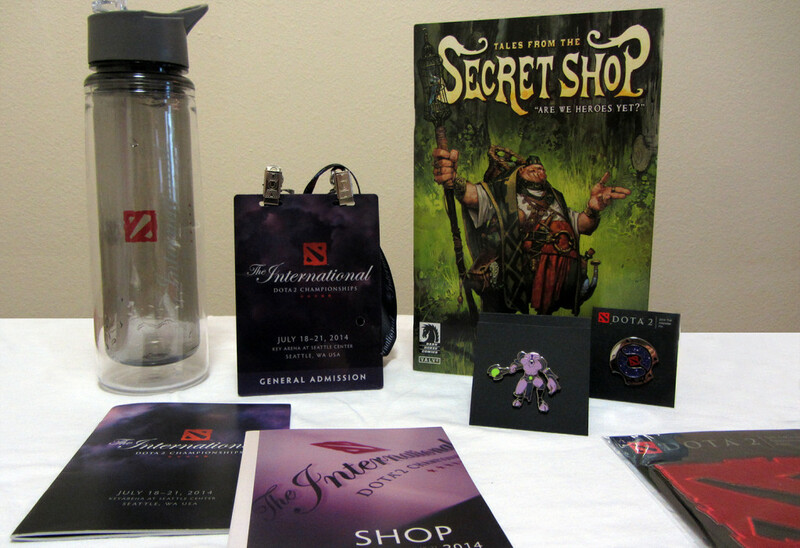 The goodie bag was filled with Dota 2 merchandise including the water bottle. Although it might sound like I just enjoyed getting a bunch of free stuff, which I obviously did, the goodie bag actually represents something more to me. It represents the amazing job that Valve did to organize and coordinate such a fantastic event. While I was there, I really got the impression that things were a long time in the making and everything was thought out and planned very well. The goodie bag and the water bottle were just a few of the tangible things that helped me feel like I received a lot of value for the $150 the general admission pass set me back. So what else did I like about TI4? Let’s move on to the widely discussed prize pool. Just the amount of the prize pool is impressive, but the fact that it was generated by the community through the Compendium is what makes it really special. This was crowdfunding at its finest. Months before the actual main event at the Key Arena, Dota players could already purchase the Compendium. This digital book was added to your Steam account and had additional features to enhance the owner’s Dota experience. Access to every match (including qualifiers) to be watched live through the Dota 2 client. Increase of Experience gained from matches. Ability to level their Compendium level. A higher Compendium level equalled even more experience gained per match and item drops like loading screens, player cards and rare items. The option to make predictions on matches, teams, most kills, most deaths and much more. Whenever the player predicted something correctly, they got more points which were added to the personal Compendium of that player which, in turn, increased the chance of item drops and experience gained from matches. Most corners of the KeyArena were filled with statues, activities and even this beautiful community gallery. The Compendium sold for a mere $10. For each Compendium sold, Valve added $2.50 to the prize pool. 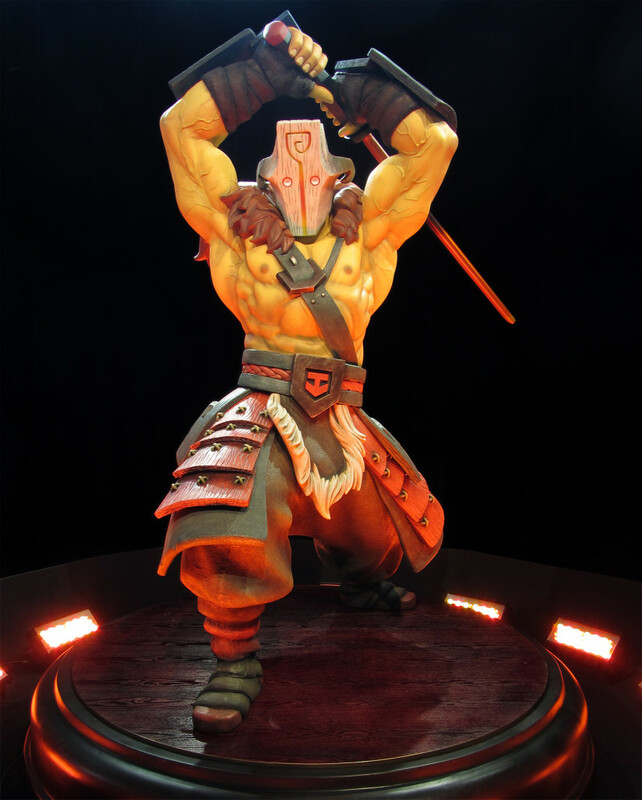 Not only did regular Dota 2 players contribute to the prize pool, they also unlocked different stretch goals which enticed other players to purchase the Compendium in order to unlock more features. This was a great move from Valve to keep the conversation focused on the Compendium, the prize pool and stretch goals and to keep contributors involved, as well as attract new supporters. This structure benefited all three parties involved. First off, Valve did not have to put down prize money themselves, encouraging the community to support a game they love instead (and they ended up banking another $30 million in the process which isn’t a bad deal either). 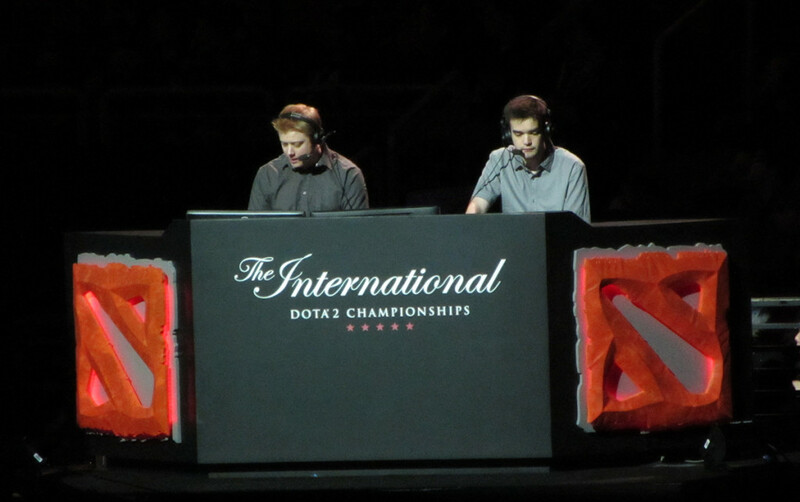 Second, the teams that competed at The International in Seattle got a shot at winning $5 million for first place. This is not only a great incentive, but also a substantial amount of resources to keep pursuing the dream of competing at this professional level of eSports. Lastly, the players who bought the Compendium got a lot more value out of their game by the boost bonus, Compendium awards and the ability to stream all the games live through the Dota 2 client. This helped players be extra involved in the game while also contributing to an increased amount of exposure and development for the global eSports community. Now that we covered the goodie bag and the massive prize pool, let’s look into the location of TI4. This giant competitive gaming event, at least by Western standards, was held in the KeyArena in Seattle. The venue is perfect since it’s used to hosting big events with plenty of food options and entrances to get into the giant space quickly. It’s no coincidence that TI4 was held in Seattle. Although fans from all over the world would probably prefer to have TI4 come to their home country so it would be easier to attend and watch matches in their local timezone, it will more than likely stay put in Seattle for a while. Valve’s Headquarters are located in Seattle which made organizing such a huge event a lot easier. The Space Needle is right next to the KeyArena where TI4 was held. While the actual event for the public only lasted 4 days in the Key Arena, the build up started weeks, if not months, before the first match was played in the stadium. Flying a big crew with equipment halfway across the world is simply an expensive joke which Valve probably preferred not to deal with and trying to coordinate through different timezones would have made things even more challenging. 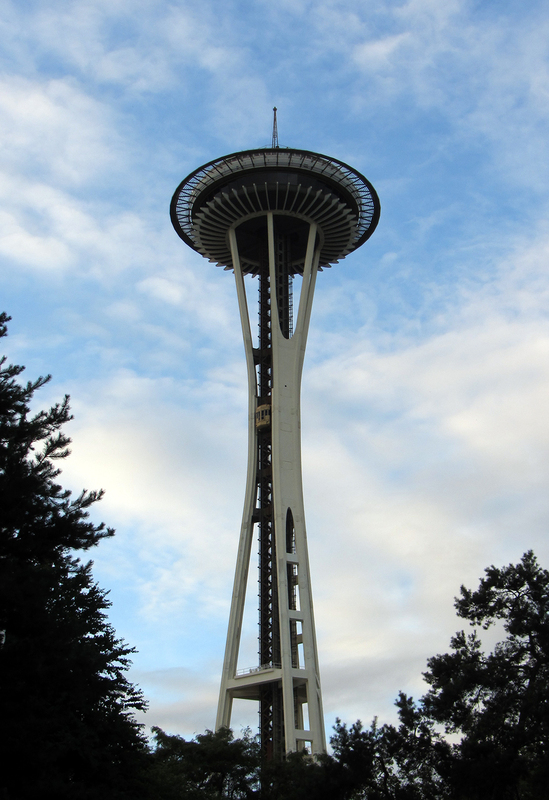 From a practical point of view, it just makes sense to keep the event in Seattle. 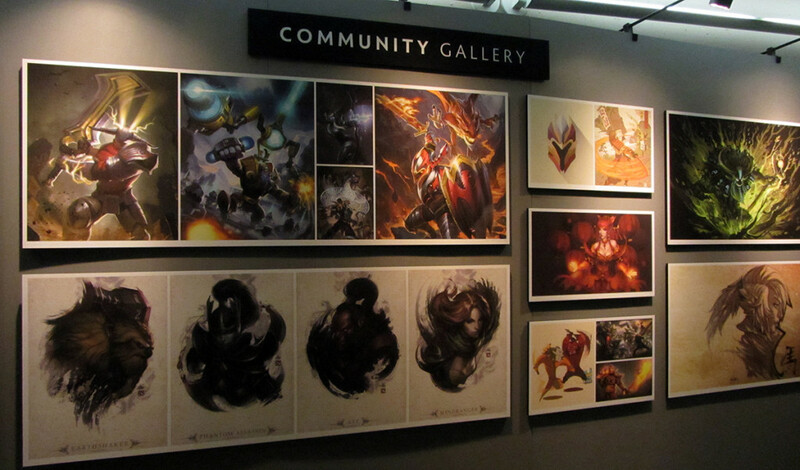 But besides the practicality for the organizers, TI4 also was able to showcase what the city of Seattle has to offer. The great food culture is a nice start, as is the extensive music scene the city is well known for. The west coast equals great food, open minded people and an awesome experience in a massive city which only adds to the appeal of going to The International. Over 15,000 people attended the event in the KeyArena. Big crowds of game enthusiasts have the tendency to attract people who love dressing up as their favorite gaming character. Since this was a Dota 2 event, the majority of cosplayers were dressed up as one of the 100+ heroes that are available today. This added to an already great vibe in the stadium while watching the matches live. Whenever teams decided to pick heroes that were exciting, like Ursa, the crowd cheered them on. Successful ganks transformed into big cheers from the crowd. It was really exciting to watch the matches unfold, especially if you were lucky enough to sit next to a decked-out Ursa fan. Juggernaut about to last hit a creep at TI4. In between games there were plenty of friendly people to talk to and cosplayers to admire and have your picture taken with. Personally, I did not feel the need to start a photo collection, but there were plenty of people who would willingly line up in order to get their photo taken with Crystal Maiden or Legion Commander. I spoke to a security guard about the event and it was funny to hear that he had never heard of the game up until working at TI4, but was now intrigued enough to try it out for himself. He also mentioned that these were easy days since there was nothing intense happening really, apart from the occasional fan who wanted to sneak into the VIP or team area. The combination of cosplayers and Dota fans in general made for a great crowd to watch the best players in the world compete for that massive prize pool. Attending TI4 confirmed what an amazing concept the competitive gaming scene already is, but also gave hints as to what it might become, which brings me to the next item on my memorable list. TI4 has shown me, and the world, what eSports have to offer already, as well as the potential growth that the future will bring. I definitely believe in the concept way more than I used to. Sitting in the KeyArena with over 15,000 Dota fans was a unique experience. I’ve been to plenty of sporting events like Formula 1 races, hockey games and Australian national rugby matches which have had decades to develop and gain solid fan bases. 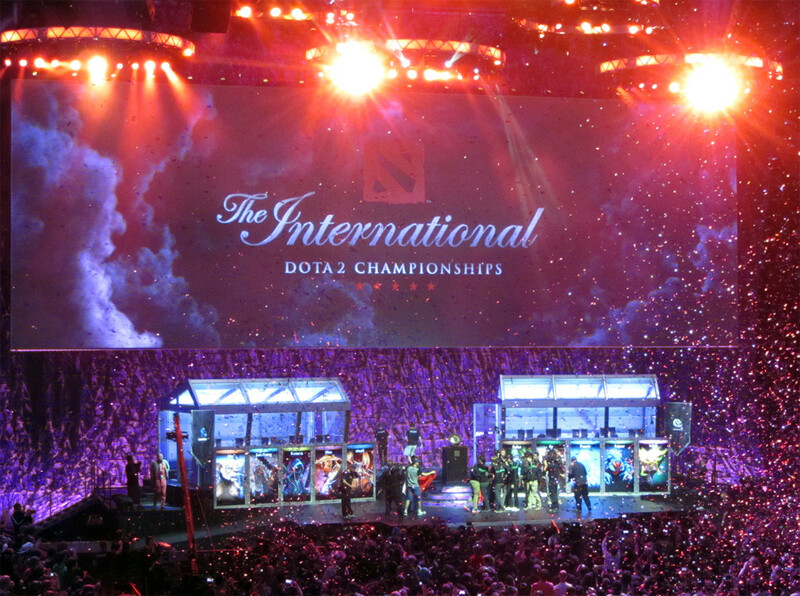 The excitement of watching TI4 live was just the same as watching any other big sporting event. Whether it’s an F1 driver that pulls off a great overtake or a Dota 2 player who successfully ganks the bottom lane, the audience goes wild just the same. Apart from the experience in the KeyArena itself, Valve did a great job with supporting the game for people who were watching it all unfold at home. Players who bought the Compendium got the possibility to watch all of the qualifiers, as well as the matches in the main event, through the game client from the comforts of their favourite chair. The results were hidden by default and only shown after clicking the reveal button so there was no risk of spoilers. Watching through the game client gave a few additional advantages over streaming it through Twitch or the Dota 2 website. You could direct the camera yourself to create your own unique experience. I personally enjoyed putting on one of the many commentaries available which also came with a directed camera. This way I could simply sit back and let the casters take me on a ride through the competitive Dota matches. For players who did not purchase a Compendium or simply did not have the possibility to watch through the game client, Valve offered another great service. The live streams! Live commentators shared their knowledge and insights about the game with everybody in the KeyArena or streaming live from any location in the world. With several live streams available (including a special Noob commentary one) there was no reason to miss any of the action. If you did miss the live broadcasting, you still had the option to watch games later. The page which offered the live video streams and later a Video on Demand (VOD) service did not show any of the match results unless you clicked the magic reveal button, so you were guaranteed the same level of excitement whether you watched it live or not. There are not a lot of sports or competitions that make experiencing such a giant event this accessible and enjoyable. And this brings me to my final thought. Please bring on TI5, I can’t wait. TI4 was a great gaming event which attracted a lot of fans who all got together to watch the best teams in the world fight over the giant 10+ million dollar prize pool. Valve did an amazing job organizing the event and making it a fun experience for everyone who took the effort to come to Seattle. They also made the effort to ensure that all the people who stayed at home to watch the Battle of the Ancients from the comforts of their desk chair or sofa would also have a great time and could enjoy the experience. From the attention to detail in things like the goodie bags, to special limited time souvenirs that could only be purchased through the secret shop at the event, to the overall smoothness and coordination of the whole thing, TI4 was an amazing experience and I can’t wait for TI5. i hope secret pulls out some more amazing strats in ti5, just like that techies pick against fnatic. dont disappoint me secret!! Hey guys, if you like Esports, you would probably like Fantasy Esports as well. If you’re an experienced player please help build a strong, vibrant community by contributing. We will also provide latest information relating to Fantasy Esports, including new service providers, tips and tricks, data analysis, and tournament updates.